Trade relations are tense between the U.S. and China, largely due to the significant trade imbalance between U.S. and Chinese exports. 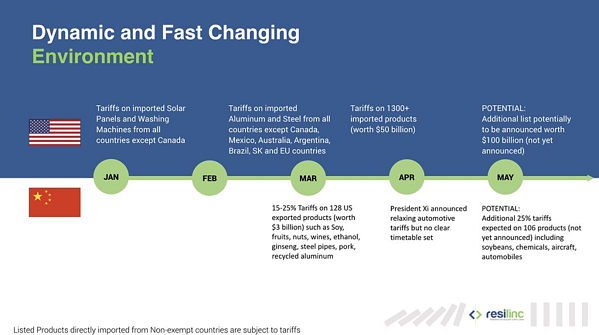 Not only have the U.S. and China already implemented several statutes imposing tariffs on products, but both countries have also announced impending lists in addition to those already implemented. 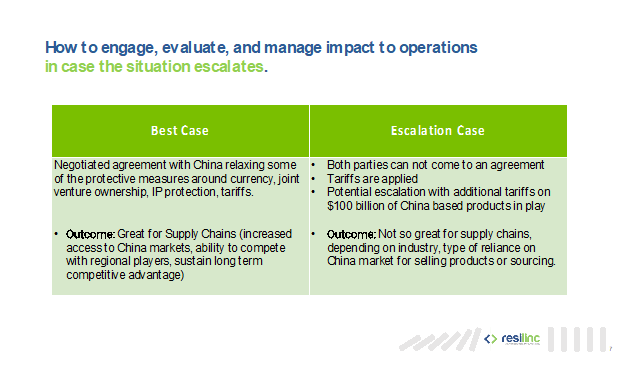 If the situation escalates, this could have significant impact on supply chain management for U.S. companies. The U.S. has imposed tariffs in China covering 1300 products worth $50 billion, and China is threatening 106 products worth $50 billion. While neither has actually imposed tariffs yet, there is potential for dislocation that could last for some time, even beyond increased tariffs. While the U.S. has threatened additional tariffs, China may choose to harass U.S. companies operating in China, or revoke/deny permits for doing business in China. China has announced tariffs on major exports from U.S., putting competitive pressure on companies exporting these products. The U.S. tariff list (Section 301) includes 1300 products such as heavy machinery, nuclear reactors, organic chemicals, and rubber. Resilinc has been digitizing supply chain data for several years, mapping more than 95% ofof supply chain elements across different industries. We have mapped 2 million parts to 140,000 sites (either making, storing, or distributing these parts) across 60,000 companies, digging 2-3 tiers deep into the supply chain. In light of the recent trade disputes with China, Resilinc examined 50 companies across different industry verticals, as well as 60,000 direct and sub-tier suppliers and their connections, and the 2 million parts currently in our system. 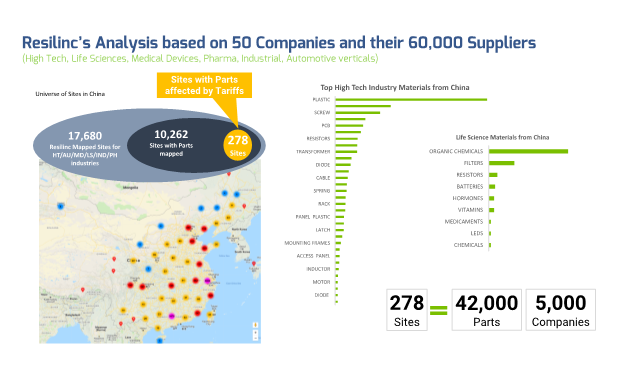 We compared these 2 million parts against the 1300 categories from Section 301, then analyzed 10,000 supplier sites in China to learn what is being manufactured at each site. We found 278 sites in China making products listed under Section 301. While 278 may not seem like a high number, this is significant because these sites are connected to 42,000 parts supplying raw materials to 5,000 companies. For an individual company attempting analysis without detailed supply chain mapping information, the impact can’t always be quantified by using macro trade data. 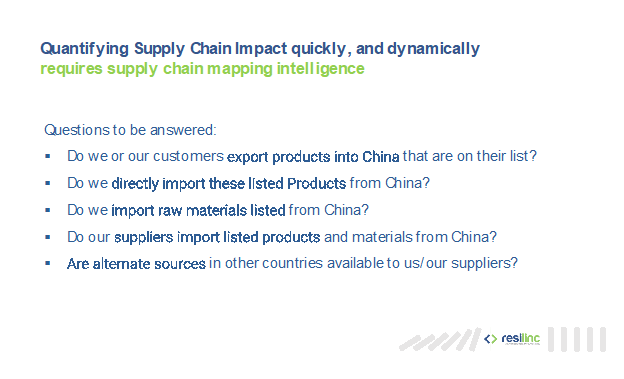 For example, your organization may not always know the origin of each individual component of your raw materials to see how trade disputes might affect your supply chain. The impact may also change based on how supply chain is structured, further complicating impact analysis. Especially for large companies with multiple sites in different countries, it can be even more difficult to quantify and properly analyze the impact in the absence of a centralized information repository like Resilinc. Most companies have not adequately mapped their supply chain and do not have enough information. Having this mapping information readily available can be extremely valuable. Because the global trade situation is so fluid, companies who have this information are very well positioned. Resilinc has a framework to help companies prepare for changes in the global marketplace. The information we have is aggregated across hundreds of sites and thousands of suppliers, but commodity assessment across 42,000 parts we have. The Y-axis shows impact, while the X-axis plots level of dependence on the China market. 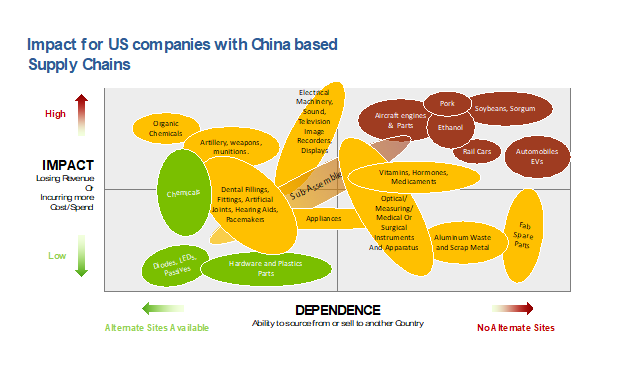 This chart has been created from perspective of a U.S.-based company with a direct relationship to China. The definition of design and impact can vary among different companies and products, which is why this graph shows the impact distributed fairly across all quadrants. 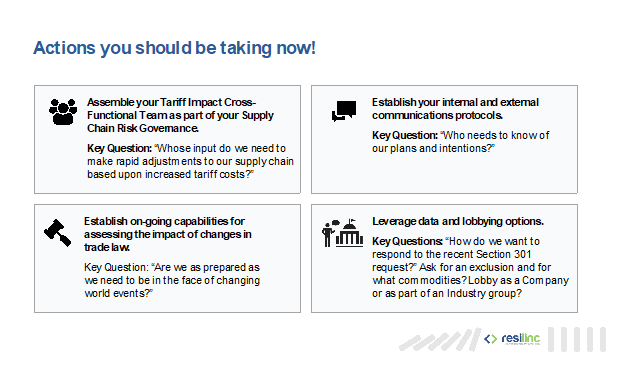 Do your own analysis of your supply chain to see what your impact might be. Simply knowing your supplier has another source available opens the door to conversations about sourcing raw materials from another country, what that process looks like, and the resources needed to qualify an alternative source? Work with your internal finance team to see what your options are and ensure consensus from your organization. Having a playbook that analyzes information in this way can help you to apply uniformly and objectively against your company. This can help prevent dissonance in your organization’s decision-making. At the very least, having this information available may help your organization to decide whether to take immediate action or make changes. Making an informed decision is far better than sitting back and hoping that all works out.